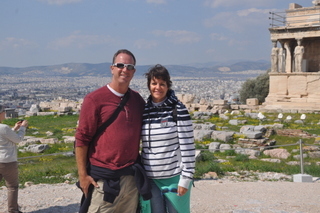 We arrived in Athens on Wednesday and Thursday was our day to head to the Acropolis and the Parthenon. The kids needed to get some school work done so we headed out around 11 AM. Our first taste of Athens was when we entered the Metro and the man in the booth yells “STRIKE!” No trains are running from 11 – 2, a three hour strike. He said to come back at 2 PM. Well, that doesn’t work very well. My first instinct was to have the kids go back and do school work all day and tackle the touring on Friday. We exited the Metro and asked a few people how far a walk to the Parthenon and they said about 15-20 minutes. With that information our walking journey began. The only problem is that we purchased 10 one way tickets the night before and now we weren’t going to need them. 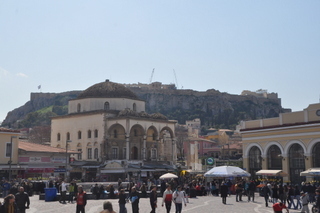 The walk was more like 30 minutes to the main market at the bottom of the hill leading to the Acropolis, but the walk was so much better than taking the Metro. We saw the state of the city with so much dirt and graffiti around the community. This is a city that is definitely struggling financially. We arrived at the Acropolis, purchased tickets and we were approached by an older Greek woman who was a professional tour guide. She offered us a tour with an Indian couple for 50 Euros and we decided to join the private tour. Our guide spoke English that not everyone could understand, but both Ilise and I were able to. Drew, Noah and Karley struggled to understand her but some of the most important facts were digested by the kids. 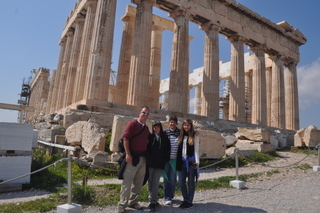 We were with our little guide group for over 2 hours and learned so much about the history of the Acropolis, the Parthenon and everything around it. Over the past few months we have been to a number of places, including Masada, The Great Ocean Road the Skyline of Dubai and now the Acropolis, where pictures just can’t capture the amazing spectacle that is before you. 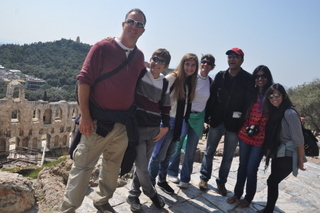 From the top of the Acropolis you can see forever in every direction. 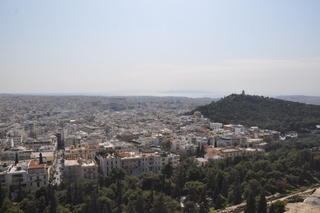 You can see the Aegean Sea, every neighborhood in Athens and monuments all around Athens. I took so many pictures but none of them were able to capture the breadth and enormous expanse of what we witnessed. It was spectacular and something I will remember for the rest of my life. I am assuming that there will be many more moments like this as we continue through Europe over the next 3 months.